( Feb 27, 2016)I came across this shop while shopping in West Wickham, browsed the racks and found a cassette of ‘Songs For Swinging Lovers’ by Frank Sinatra as a present for my mum to play in her new cassette/radio. Also bought a Gerry Mulligan Quartet CD for myself. Unlike some other people who have commented, I didn’t notice the owner being miserable, but there again I don’t remember him being cheerful either. Thanks to the long-departed Showells records of West Wickham. Oh yes, I remember Showells. Along with KMK (Beckenham High St), the Record Trade Centre (Clockhouse), and the short-lived Strummers (Penge High St). And of course Bonapartes (East Croydon). I can even remember Robertson's in Beckenham! Showells Record Shop in West Wickham. What a miserable **** the bloke in there was. 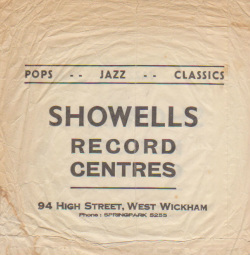 Picture of Showells Record Centre bag.